Abstract. Himalayan glaciers are important natural resources and climate indicators for densely populated regions in Asia. 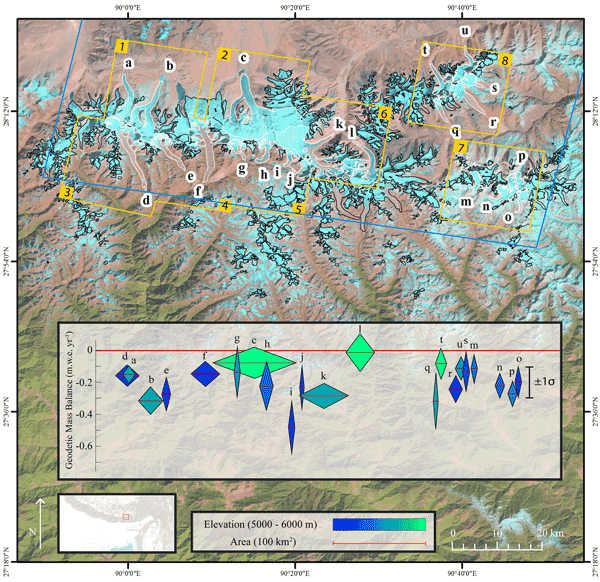 Remote sensing methods are vital for evaluating glacier response to changing climate over the vast and rugged Himalayan region, yet many platforms capable of glacier mass balance quantification are somewhat temporally limited due to typical glacier response times. We here rely on declassified spy satellite imagery and ASTER data to quantify surface lowering, ice volume change, and geodetic mass balance during 1974–2006 for glaciers in the eastern Himalayas, centered on the Bhutan–China border. The wide range of glacier types allows for the first mass balance comparison between clean, debris, and lake-terminating (calving) glaciers in the region. Measured glaciers show significant ice loss, with an estimated mean annual geodetic mass balance of −0.13 ± 0.06mw.e.yr−1 (meters of water equivalent per year) for 10 clean-ice glaciers, −0.19±0.11mw.e.yr−1 for 5 debris-covered glaciers, −0.28±0.10mw.e.yr−1 for 6 calving glaciers, and −0.17 ± 0.05mw.e.yr−1 for all glaciers combined. Contrasting hypsometries along with melt pond, ice cliff, and englacial conduit mechanisms result in statistically similar mass balance values for both clean-ice and debris-covered glacier groups. Calving glaciers comprise 18% (66km2) of the glacierized area yet have contributed 30% (−0.7km3) to the total ice volume loss, highlighting the growing relevance of proglacial lake formation and associated calving for the future ice mass budget of the Himalayas as the number and size of glacial lakes increase. How to cite: Maurer, J. M., Rupper, S. B., and Schaefer, J. M.: Quantifying ice loss in the eastern Himalayas since 1974 using declassified spy satellite imagery, The Cryosphere, 10, 2203-2215, https://doi.org/10.5194/tc-10-2203-2016, 2016. Here we utilize declassified spy satellite imagery to quantify ice volume loss of glaciers in the eastern Himalayas over approximately the last three decades. Clean-ice and debris-covered glaciers show similar magnitudes of ice loss, while calving glaciers are contributing a disproportionately large amount to total ice loss. Results highlight important physical processes affecting the ice mass budget and associated water resources in the Himalayas.